2 How Do You Tuck the Wings to Roast a Chicken? Free-range, organic farming methods produce smaller chickens with less fat and smaller breasts. While the lower fat content and freedom from hormones and antibiotics make these chickens a healthier choice, they also require some means of keeping the meat moist and an adjustment in cooking times to retain the most flavor and best texture. Poultry preparation methods from before 1940 work well for smaller chickens, because chickens lived outdoors at the time and received no antibiotics or hormones. Remove and discard the packaging from the chicken. Remove the giblet package from the chicken and set it aside in a bowl of water in the refrigerator. Lay the chicken breast-side up in the glass baking dish. Mix the hot sauce and olive oil together in a small mixing bowl. Brush the mixture over the entire chicken with a pastry brush before turning it breast-side down. Finish brushing the hot sauce mixture over the chicken and pour any leftover sauce into the reservoir in the vertical stainless steel chicken roaster. 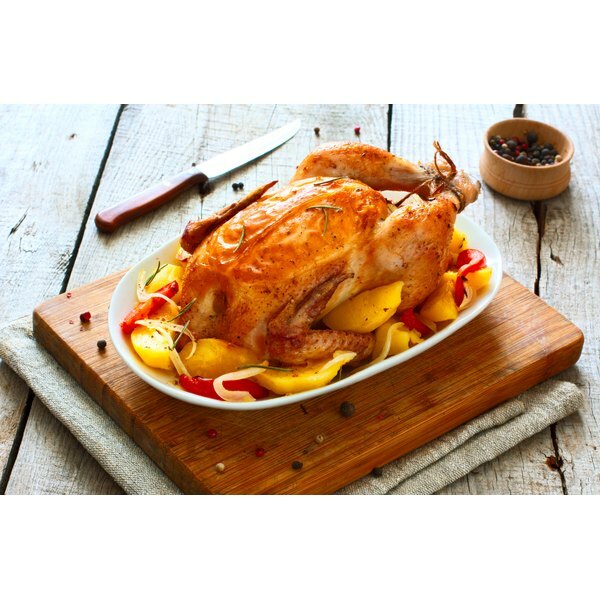 Fill the reservoir of the vertical stainless steel chicken roaster with beer, ginger ale, pineapple juice, apple juice or sherry and insert it into the chicken between its legs. Stand the chicken in the glass baking dish, using its legs and the vertical chicken roaster as a tripod. Roast the chicken for one hour. Remove a corner of the foil and insert a meat thermometer into the breast of the chicken without touching any of the bones. Replace the foil if the thermometer does not register at least 165 degrees and cook for an additional 15 minutes before testing the temperature again. Remove the pan from the oven and allow the chicken to stand on the counter, covered, for three to five minutes. Remove the chicken from the vertical roasting stand and pour the pan drippings and the liquid from the reservoir into a 2-qt. saucepan. Add enough chicken broth to bring the total amount of liquid to 2 cups. Mince the chicken liver from the giblets and add it to the saucepan as well. Add 2 tbsp. flour or cornstarch and stir until well-blended. Bring the mixture in the saucepan to a rolling boil while stirring constantly. Boil for three to five minutes or until the mixture thickens into gravy. Serve over mashed potatoes with slices of the modified beer-can chicken. Remove chicken from its packaging and remove the giblet packet. Discard the packaging and reserve the giblets in a bowl of water in the refrigerator. Place the chicken breast-side down on a cutting board. Begin at the neck opening, using sharp kitchen shears, and cut along the left side of the backbone all the way to the left side of the tailbone. Make the same cut on the right side of the backbone and remove it, reserving the backbone with the giblets. Spread the chicken flat on the cutting board to expose the breast bone and ribs. Slide a boning or filleting knife under the end of the breast bone. Place your thumb on the bone and pull upward until an inch or so of the breast bone separates from the breast. Put the knife aside, grasp the breast bone and tug until the entire bone comes away from the meat. Reserve the breast bone and any rib bones you remove, placing it with the giblets and backbone to make chicken stock later. Rub the chicken all over with olive oil and place it in the gallon-size, plastic, zipper-style bag. Add rosemary leaves, marjoram, fresh-ground black pepper and chopped parsley. Cut each lemon into four pieces and squeeze the juice onto the chicken. Add the lemon quarters to the reserved bones and giblets. Strike the garlic cloves with the flat side of a chef's knife to split the skins. Peel each clove and add the garlic to the bag with the chicken. 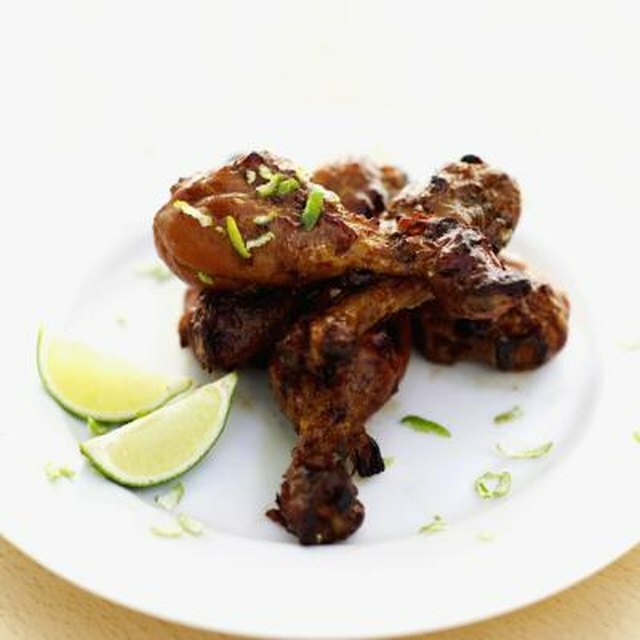 Marinate the chicken for at least six but no more than 48 hours. Remove the chicken from the bag and spread it on your gas grill, skin-side down. Follow the manufacturer's instructions to turn on the grill and adjust the flames to supply medium heat. Close the grill cover and allow the chicken to cook for 10 to 15 minutes. Turn the chicken and grill for an additional 10 minutes before checking the temperature with a meat thermometer in the thickest part of the breast and thigh. Use tongs to remove the chicken from the grill when the thermometer registers 165 degrees in the breast or at least 180 degrees in the thigh. Place it on a clean platter that has not held any raw meat and serve it immediately. Cut six fist-sized red-skin potatoes, carrots, turnips and parsnips into bite-size chunks in a 6-qt. or larger slow cooker. Add 1 cup sherry and 2 cups chicken broth. Peel two fist-sized Bermuda onions and chop two stalks of celery, including the green tops. Stuff the onions and celery into the cavity of the 3-lb. or smaller stewing chicken after removing the giblet package. Place the giblet package in water in the refrigerator for later use. Place the onion-stuffed chicken on top of the vegetables in the slow cooker and close the lid. Cook on high for one hour, turn to low and cook for one additional hour. Test the chicken temperature with a meat thermometer. Turn off the slow cooker and serve the chicken if the thermometer registers 165 degrees in the breast and 180 degrees in the thigh. Cook for 30 additional minutes if it does not. Although no evidence exists of any harm from inserting a beer can or other aluminum beverage container into the chicken, using a vertical stainless steel chicken roaster instead eliminates any possibility that the paint on the beer can or the aluminum of the can itself might contaminate the meat.